GoDaddy is one of the most popular domain registrar and web hosting provider companies in the world. They have over 18 million active customers. And, there are 77 million domain names registered under GoDaddy. They provide multiple web hosting solutions which include from shared, dedicated, to even VPS hosting service. However, we have put together this post for readers who are looking for a review of the VPS hosting service of GoDaddy. In this article, we will share everything you need to know about their VPS Hosting service. We will even share some secret information about GoDaddy. So, if you are thinking about using a GoDaddy VPS hosting service. You can start to read the rest of the post. So, without wasting more of our time, let’s go. VPS (Virtual Private Server) hosting is not a new concept at all. However, most of the web hosting companies have started to offer this type of web hosting to the public recently. The VPS hosting is the type of hosting where a virtual server will be given to you by the web hosting providers. And, that virtual server will have a specific amount of resources dedicated to it. However, the resources (Ram, CPU Powered, and Storage etc.) will be drawn from a physical (parent) server. Eventually, the physical (parent) server would contain a massive quantity of resources. Then the resources will be allocated and will be served as multiple virtual servers. So, in a way, you are using a shared parent server but at the same time, you are getting a specific amount of resources dedicated to your virtual server. That way, you will always have a stable performance from your server. It is not similar to the shared hosting service. Where if your or other users’ websites receive a lot of traffic at once, all of the websites of that particular shared server will be slow. As you are getting dedicated resources, it won’t matter if your websites are receiving a lot of traffics at once or not. If you use VPS hosting, your website will perform always the same. Another perk of using VPS hosting is that it is highly scalable. You can add or remove resources from your virtual server at any moment. Because of this, many people tend to use VPS hosting over shared hosting. However, VPS hosting is a bit pricier than ordinary shared hosting plans. Now, we will know all about the pricing of GoDaddy VPS hosting plans. GoDaddy offers both Windows and Linux OS based VPS Hosting plans. To be noted, the Windows OS based packages are a bit pricier than the Linux OS based packages. Let’s start with the Linux OS based VPS packages. For Linux OS users, there are 4 packages. They are known as Economy, Value, Deluxe, and Ultimate respectively. Let’s get into greater detail about these packages. If you want to try VPS hosting for the first time, then you can start with the ‘Economy’ plan. This plan will cost you at least 29.99$ per month. And, in return, you will get 1 GB Memory, 40 GB Storage space, Unmetered Bandwidth. As well as you will also get 3 dedicated IPs and free SSL certificate for 1 year for your domains. By spending a little more than the ‘Economy’ pack, you can get the ‘Value’ pack. This will be only 39.99$ per month. In exchange, you will get 2 GB of RAM, 60 GB Storage, Unmetered Bandwidth. Also, the 1 year free SSL certificate and 3 dedicated IPs will come with your package. The Deluxe VPS hosting plan would be the best value package in our opinion. Because you don’t have to spend a whole lot of money to get this package. On the opposite, you will get some of the best features and specifications with this package. The price of the Deluxe plan is 69.99$ per month. And you will be receiving 4 GB RAM, 120 GB Storage Space, 3 dedicated IPs, free 1 year SSL certificate, and unmetered Bandwidth. 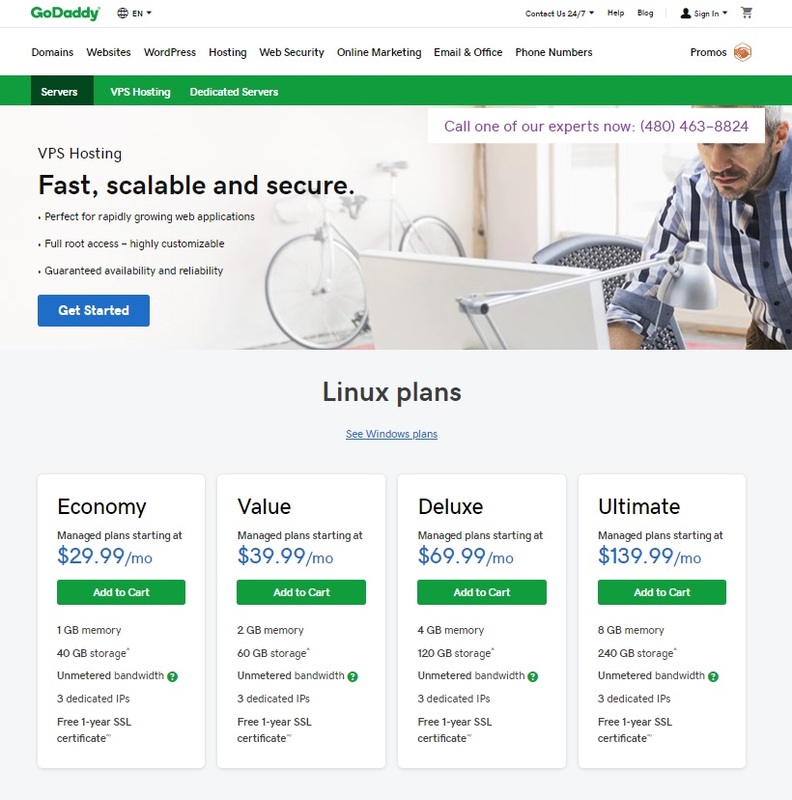 Now, let’s talk about the most expensive VPS plan (Linux) from GoDaddy. The price of this package is 139.99$ each month. You will get 8 GB RAM, Unmetered Bandwidth, 240 GB storage, 3 dedicated IPs and free 1 year SSL certificate. GoDaddy has been offering 4 VPS hosting packages which are Windows OS based. The names of these plans are also Economy, Value, Deluxe, and Ultimate respectively. Let’s see what those are all about. The ‘Economy’ hosting plan will cost you the lowest. You have to pay at least 39.99$ per month to get this Windows OS based VPS plan. The specifications of this plan are 2 GB Memory, 40 GB Storage Space, Unmetered Bandwidth. Along with all these, you will also get 3 dedicated IP address and free 1 year SSL certificate. And, you can host as many websites as you want with your hosting account. If you want some extra resources then you can take a look at this plan. The Value plan will cost you 59.99$ each month. However, you will get 90 GB storage, 3 GB RAM, Unmetered Bandwidth. Also, you will get 3 dedicated IP address, and 1 year free SSL certificate with this plan as well. If you are searching for a VPS hosting plan which has an affordable price but also come with some of the best features then the ‘Deluxe’ plan will be the best for you. The Deluxe plan starts at 79.99$ per month. And, you will get 4GB Memory, 120GB Storage Space, Unmetered Bandwidth, 3 Dedicated IPS, and free 1year SSL certificate. If you have the budget and want the best performance from your websites then you have to get this package. This might be the priciest package of them all but we bet that it has the best features and specifications as well. So, even though you will have to pay 149.99$ for this package, your spending will be worth it. The Ultimate package will provide you with 8 GB of RAM, 240 GB of Storage. Added to that, you are getting monthly unmetered bandwidth, free 1 year SSL certificate. The prices of the VPS hosting plans mentioned here are subject to change. 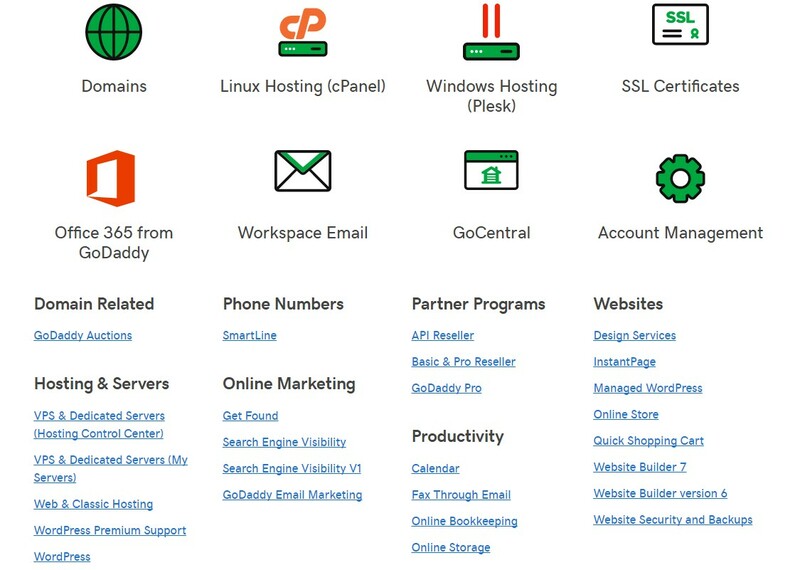 And, GoDaddy offers 3 level of hosting management (Self-managed, managed, and fully managed). The price of the packages also depends on the level of management you choose. By default, all of the packages are ‘Managed’. But, if you want to get the ‘Fully-Managed’ option then you have to pay an additional 120 $ per month. And, if you choose the ‘Self-Managed’ option then you can save 10$ per month from the standard payment. Also, GoDaddy runs some promotions on a regular basis. You will get the best price if you wait for those. Who should use the GoDaddy VPS Hosting Plans? VPS hosting is great for everyone. However, if you are satisfied with using shared hosting then you should not change your hosting package. On the contrary, if your websites are growing and your current shared hosting can’t take the load then you should turn to VPS hosting. Normally, the VPS packages of GoDaddy comes with ‘Root Access’. That means you will have the total control over your server. 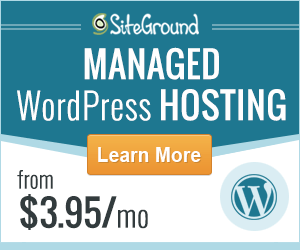 So, if you want more control over your hosting environment then this could be a great choice for you. Another awesome feature of GoDaddy VPS hosting is that it is highly scalable. So, if your current package is not enough customizable then you can opt to upgrade your package. And, GoDaddy offers an instant upgrade solution. You can upgrade your account anytime you want. The VPS plans of GoDaddy is perfect for all types of users. Whether you are a professional or a newcomer on owning a website, there won’t be any problems at all. Because there are 3 management levels which are Self-managed, managed, and fully managed. If you want customizability and a professional then you can choose the ‘Self-managed’ hosting level. In case of that, you have the total control over your hosting environment. You can customize your server the way you want. You can install any software on your server. There is not any limitation. But, if you are not a professional on managing VPS servers, then you can choose the Managed or Fully-managed packages. That way, every technical issue regarding your servers will be taken care of by the GoDaddy team. So, if you want high customizability, scalability and better performance from your websites then you can start using VPS hosting. Whenever you are searching for a new web hosting provider for your website, you have to know if that web hosting provider supports all types of web applications. Because the moment you acquire your new hosting account, you will want to install your favorite web app on your hosting environment to launch your website. However, there are a lot of web applications out there. And not all of the web hosting companies support each and every one. On the contrary, GoDaddy is well ahead of the competition on supporting different web applications. GoDaddy supports all the major web applications and CMSs. So, you can use your favorite CMS (Content Management System) with ease. GoDaddy offers 1 click quick installation of 125+ web applications which includes all the popular CMSs like WordPress, Joomla, Magento, Drupal etc. And, if you get the Windows OS based packages, you are able to install 50+ web applications with just a few clicks of your mouse. All of these can be done just straight from your control panel. All of the VPS servers of GoDaddy is fully optimized for all the major CMSs. Even you don’t have to update your current CMS from time to time. As GoDaddy has a built-in tool (auto-updater) which can automatically update most of the CMS on the go. This tool will help you a lot to save your precious time. You should know that you have to update your CMS regularly. Otherwise, it would be easy for hackers to hack your outdated CMS as well as your websites. For website owners, it is one of the most prevalent causes of being hacked. For this reason, GoDaddy is very strict about updating the current CMS of their users’. All in all, we can say that GoDaddy is perfect for all the popular web applications available till date. Every VPS hosting account of GoDaddy comes with ‘Root Access’. You will have the super-user accessibility to your virtual server. For that reason, you can install any custom script, software, CMS on your server. That means you are in full control of your hosting environment. Every VPS servers are ‘Managed’ by default. That means, everything server sided will be taken care of by GoDaddy. You don’t have to worry about patching, updating the software of your servers. You don’t even have to worry about the security of your server. However, if you want you can also use ‘Self-Managed’ package. Using that you can manage your server the way you want to. GoDaddy uses multi-layered security system throughout their entire infrastructure. Your websites are always under constant monitoring. They have set up security software to make sure that no crawlers, bots or even hackers can’t breach their security system. All of the VPS servers provided by GoDaddy are equipped with additional CPU power. So, that the servers can take any additional load effortlessly. There are a lot of additional services from GoDaddy available for a small amount of fee. One of the most important ones is the ‘Site Backup and Restore’. You have to pay 4.99$ per month to enable this service. And, your sites will be asked up automatically every day. So if you need to restore your files anytime, you can do that. GoDaddy has some very powerful host servers. The host server contains 2x Intel E5-2620v3 CPU, 15M Cache, and 2x 600GB HDD. All of the VPS servers are highly scalable. You can add any amount of resources to your virtual server anytime you want to. You can do that from within your control panel and it will not even affect the uptime of your websites. Normally, it takes some time to set up a virtual server. But with GoDaddy, it is totally the opposite. The servers are already set up. So, when you buy a VPS account you will get access to your account within minutes. Every VPS hosting package comes with unlimited hosting facilities. That means you will be able to host unlimited websites with any VPS packages. Also, you are allowed to create unlimited email accounts, databases, FTP accounts etc. You will get ‘Plesk’ control panel with the Windows OS based packages and ‘cPanel’ with the Linux packages. And, with the self-managed packages, there will be no control panels so that you have the freedom to use anything you want to. There are a lot of other features and services which are offered by GoDaddy. You will be able to know about them from their own site. We will skip them to save time. Before you go with a web hosting company, you need to be sure if your website would be faster with them. Because if your website is not fast enough then you will lose a lot of visitors. You know that there is not a single person who likes a slow website. So, it is clear that you must have a fast website. But, how do you get one? The answer is simple. You have to choose a web hosting company which has high-quality serves. Although there are a lot of factors which impact the speed of a website, the most important one is the hosting of that website. So, you have to get your web hosting account from a prominent provider who is known for fast web servers. So now, we will test if GoDaddy has faster servers or not. We will be testing the load speed (using Pingdom) of a website which is hosted on GoDaddy. That way, we will be able to know the quality of the GoDaddy servers. Pingdom has a number of servers to test the speed of any website all over the world. The test will be done using the Washington D.C. test server. So, let’s see. So, we have got our result. In the screenshot above we see that the ‘Performance Grade’ of our test website was ‘C’. This could be a lot better. However, the ‘Performance grade’ is not related to the quality of the hosting provider. On the flip side, it is up to the owner of the website to improve the ‘Performance Grade’ of their websites. Here, the ‘Load Time’ is related to the quality of the server of GoDaddy. The less the load time of your website is the better. If the load time is less than 2 seconds, then you can say that you have a fast loading website. However, in our case, we can see that the load time of our test website was only 362 ms. This is way lower than 2 seconds. You could literally say that the website loaded within a blink of an eye. So, it is clear as daylight that GoDaddy obviously has some high-quality web servers. Unless our test website wouldn’t be able to load within such a short time. So, you should not worry if you are going with GoDaddy but at the same time want faster websites. We can guarantee you that if you host your website on GoDaddy, you will be happy with the fast load speed of your sites. The uptime record of a web hosting company can be a great factor behind choosing that particular provider to host your websites. If a web host company is not capable of keeping the industry-standard uptime then you should not use them. So, before you want to try GoDaddy VPS hosting service, you should know about their real uptime record. You can learn about the uptime record of GoDaddy by visiting their own website. However, you should know that this is not a wise idea. As it is a common thing for the web hosting companies to make false claims about their uptime record on their sites. That way they can get more customers by fooling them. So, we haven’t believed what GoDaddy had to say on their website. Instead, we have taken another approach to get to know the real uptime record of GoDaddy. What did we do actually? We have hosted one of our test websites on GoDaddy hosting. And, since then we are observing the uptime stat of that website. We are doing this, especially for our readers. So that we can show you the real uptime record of GoDaddy. For your information, the uptime record is updated regularly, so if you want to know the latest update, you can come back here anytime. 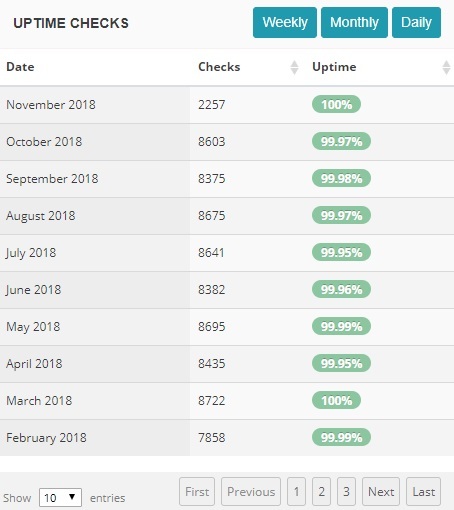 The uptime record of GoDaddy web hosting service for the last 10 months. So, what do you see? It is clear that GoDaddy is maintaining 99%+ uptime on average. And, most of the months, their servers were up 100% of the time. That means there was no downtime at all. It is definitely unbelievable. So, we can say that GoDaddy is actually maintaining the industry standard uptime. And they are not making any false claims at all. A great web hosting company must have a helpful customer service team. Otherwise, it would be hard for website owners to deal with all kinds of technical difficulties on their own. There are a lot of web hosting companies which don’t care about their customers. You should avoid them by all means. Luckily, GoDaddy is not like that. On the opposite, they are very well known for their world-class customer support. Even we also got positive stance about their customer support system. We had to contact them on several instances. And, they were always helpful to us. You can contact GoDaddy 24/7 all-round the year. You can create an account on their site and use any of the methods mentioned below to get in touch with them. The best way to contact them is via ‘Live Chat’ and ‘direct call’. They have a country-based call center for their customers all over the world. So, if you want fast solutions to your problem, you can directly call them. Another great thing about owning a VPS hosting account with GoDaddy is that you will be given priority while contacting their customer service team. GoDaddy is very fast on replying their customer’s queries. We never had to wait more than a couple of minutes to contact them. And whenever you are in any problem, they will show you the easiest and fastest solution. So that anyone can solve the issues easily. For people who are not comfortable talking to the customer representatives directly, GoDaddy has created a whole lot of tutorial articles and videos. You will find those knowledge-based articles on their support page. All of the articles are organized in categories so that anyone can find the solution of their specific issue as soon as possible. You can find the how-to-videos on their official YouTube channel as well. So, if you are not into reading articles, you can watch and learn from the videos. We have to admit that we loved the support system of GoDaddy. We hope you will love them as well. Last Words: Should you use GoDaddy VPS Hosting Service? Because GoDaddy is offering a lot of very useful features and services with each of their VPS hosting packages. On top of that, the price of those plans is very reasonable for VPS hosting packages. And, there are total 8 packages to choose from. So, it is guaranteed that you will find your perfect match among those packages. Besides that, you are getting highly customizable and scalable servers. You will have more control over your hosting environment. Added to that, the super helpful customer service of GoDaddy have got your back. Whenever you face a problem related to your VPS account, you can sort that by contacting them. 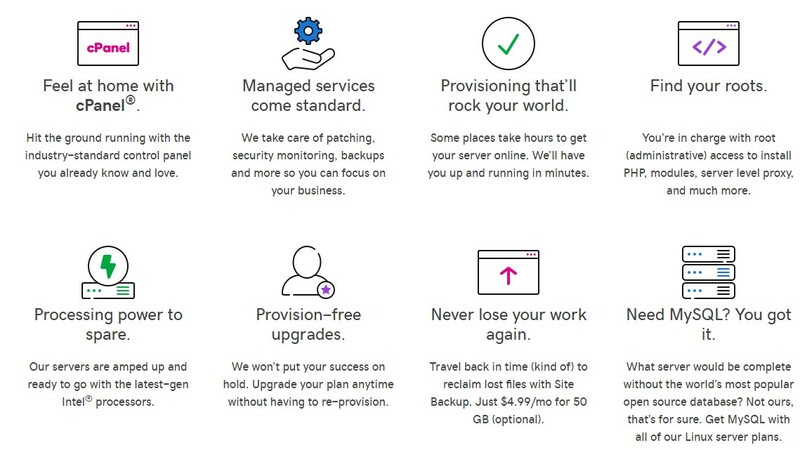 So, if you’re looking for flexibility, high-quality secured servers, industry-standard uptime, and professional customer service then GoDaddy VPS hosting could be your next choice. GoDaddy is offering a lot of very useful features and services with each of their VPS hosting packages. On top of that, the price of those plans is very reasonable for VPS hosting packages. And, there are total 8 packages to choose from. So, it is guaranteed that you will find your perfect match among those packages.